On Zambia’s coat of arms are etched the country’s official motto: “One Zambia, One Nation”. In a country where it is widely believed – though the real number is unknown – that 70 ethnolinguistic groups live side by side, Zambia’s motto was adopted, in 1964, to instill the importance of national unity. A point of elevated pride to many Zambians, this is a unity that has seen Zambia remain peaceful in the half-century of its existence as a nation. In this peace, the leadership of Kenneth Kaunda cannot be over-estimated. At the forefront of Zambia’s independence struggle from British colonial rule, Kenneth David “Buchizya” Kaunda became Zambia’s first president in 1964. Although he is Zambia’s most prominent political thinker; espousing a nationalist political ideology that he called ‘Zambian humanism’, as with most public leaders, Kaunda’s legacy needs unpacking. Kaunda senior had himself been born during the 1878 war at Lisali and had been a young boy when his own father, Mtepa, was killed in the war. To observers such as politician, and Kaunda confidant, Tiyaonse Kabwe, Kaunda is a hero who ushered in independence; a leader with good intentions caught up in circumstances beyond his control. To others, Kaunda was an undemocratic leader who stretched out his tenure too long and mismanaged the country’s economy. And though his leadership was not without violence, some are fervent in their praise for his commitment to nonviolence. If this mixed picture is anything to go by, it is a testament that with concerns of legacy, there can be no simplistic understanding. It is unsurprising that the historical import of Kaunda’s leadership is contested; as the distance that some see between the ethical norms he espoused and how he actually governed may be as much real as they are perceived. There is one thing, however, that can be little disputed; and that is that in his efforts to harmonise Zambia’s ethnolinguistic groups into a single functional nation-state – whose citizens would identify as Zambians – Kaunda succeeded. As proof, there are few Zambians today who would attribute the sense of Zambian-hood that they feel to anything but the leadership of Kenneth Kaunda. During his presidency, Kaunda went about achieving his ideology of ethnic balance through an active policy of giving political, cabinet, and government appointments to Zambians from the major ethnic groups. With so many ethnic groups vying for representation and only so many government positions to be filled, Kaunda’s system could not be said to be perfect by any means and it did not always achieve the stated goals. Indeed, although Zambia has remained largely peaceful since its independence, the country has also had its share of ethnic-based tensions. In the decade immediately before and after independence, ethnic tensions remained a distinct threat to Zambian unity. The ethnic divisions, which had fermented in the pre-independence period began to spill-over into the new nation. After independence, ethnicity remained the strongest and most logical form of identification for many Zambians. It was in response to this challenge, to which Kaunda was highly attuned as a result of his own family’s history, that Kaunda developed and effected a political ideology and agenda of nationalist unity. Kaunda was born on April 28, 1924, at Lubwa mission in northern Zambia to David Julizya Kaunda and Helen NyamNyirenda, who were missionaries from Malawi. David and Helen were devout Christians with the Church of Scotland; and were the first African missionaries sent to northern Zambia to build schools and educate the next generation of African evangelists and teachers. Kaunda’s father came to Zambia in 1904, having walked a hundred miles from his home. He had arrived shortly after a prolonged and violent Bemba uprising against white settlers and he quickly gained the respect of his hosts in the chiefdom of the Bemba. No stranger to conflict, Kaunda senior himself came from an ethnic group – the Tonga – who had been the victims of subjugation and incessant raids from the Ngoni in the first half of the 19th century. In 1855, the politically and militarily superior Ngoni overran the Tonga. Kaunda senior had himself been born during the 1878 war at Lisali and had been a young boy when his own father, Mtepa, was killed in the war. Following Mtepa’s death, Kaunda senior’s mother, NyaChirwa, moved the family of four children to Elangeni in Malawi’s northern region, and also the seat of the Ngoni. In 1884, the Ngoni admitted Christian Missionaries from South Africa to their chiefdom and it was through these missionary activities that Kaunda senior became a Christian. Despite protests from both families, Kaunda senior would soon marry Helen; a woman from a different ethnic group than his own. It was so that Kenneth Kaunda grew up in a bilingual, bi-ethnic home, situated in a multicultural community. His upbringing foretold his split with the African National Congress (ANC), which he had joined in the late 1940s. Having risen to prominence within ANC ranks by 1957, his loyalty to party leader Harry Mwanga Nkumbula, would come to an abrupt end when, at a heated meeting of party leaders, Nkumbula called Kaunda a foreigner—a reference to his Malawian heritage. Lacking patience for Nkumbula’s brand of ethnic politics, Kaunda – together with the ANC’s more militant youth wing – formed the Zambia African National Congress party (ZANC) in the late 1950s. It is unsurprising that the historical import of Kaunda’s leadership is contested as the distance that some see between the ethical norms he espoused and how he actually governed may be as much real as they are perceived. 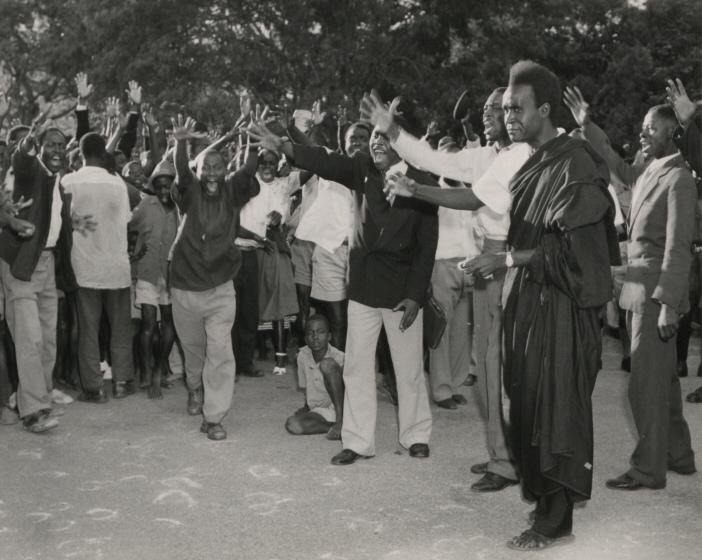 There was a telling day in Lusaka, in the February of 1968. It was four years after independence and what had been reformed into the United National Independence Party – after ZANC was banned by the colonial authorities – was holding a major party leader convention. Delegates sat in groups according to ethnic or regional affiliation as they traded accusations and ethnically charged insults. The 5th of February was the last day of the convention and tensions were high. Kaunda sat in silence on the dais all day observing the confusion. When he rose to speak, it was to announce that given what he had just witnessed he believed himself to have failed in uniting his country and was effectively resigning from the presidency. By resigning, he said, the party could maybe find someone suitable to hold the country together. He left the convention hall and went home to prepare for transition. According to former member of parliament, Sikota Wina who documented the events in A Night without a President, senior church leaders and cabinet officials spent the night and morning convincing Kaunda to take back his decision. By morning, Kaunda was still president. It is not known whether Kaunda was serious about resigning but it seems clear that the events at Lusaka, coupled with the policies of ethnic balance he would go on to implement, pulled Zambia back from a brink that would have thwarted the development of the nascent Zambian nation. There is no doubt that the legacy of Kenneth Kaunda is a mixed one; it was after much opposition and criticism that Kaunda signed a new constitution in 1990 ushering in multi-party politics. However, the unity that most Zambians alive today are proud of is squarely attributable to the life and work of Kenneth Kaunda. Derrick M Muwina is from Zambia. He is a PhD candidate in Theological Ethics at Boston University’s School of Theology. His dissertation focuses on Christian Humanism in Zambia in the independence era. I so much cherish him. A motto that spell unity and build a none ethnic nation.